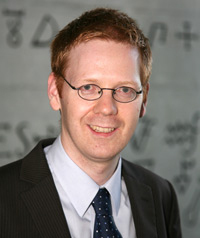 Christian Heinis studied biochemistry at the Swiss Federal Institute of Technology in Zurich (ETH). After a PhD in the research group of Prof. Dr. Dario Neri at ETH, he did two post-docs, the first one with Prof. Dr. Kai Johnsson at the Ecole Polytechnique Fédéral de Lausanne (EPFL) and the second one with Sir Gregory Winter at the Laboratory of Molecular Biology (LMB) in Cambridge, UK. In 2008 he started as Assistant Professor at EPFL (supported with an SNSF professorship) and was promoted in 2015 to Associate Professor. He is co-Director of the NCCR Chemical Biology, member of the NCCR Steering Committee and the NCCR Education Committee..
His research aims at developing therapeutics based on peptide macrocycles using novel biological and chemical tools. An important activity of his laboratory is the generation of antagonists based on bicyclic peptides by phage display. Christian is a scientific co-founder of the start-up company Bicycle Therapeutics. Read more about Christian Heinis’s research on his lab website.